I am not a fan of beer, but I really love the flavor it adds when you cook with it. This soup is the perfect example of that. 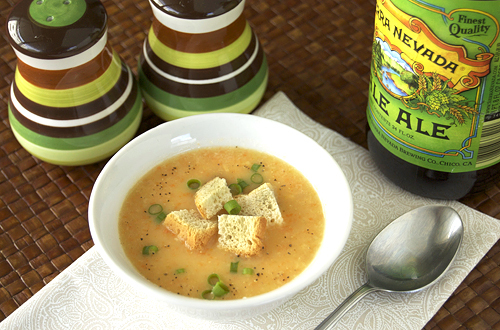 The beer gives this cheese soup an extra flavor that is addicting. I think it is safe to say that we all love cheese (well most of us) so imagine a soup packed with cheese plus an extra pale ale flavor kick. Perfection. I have to tell you that I used the new Kraft fat-free cheddar cheese and skim milk for my soup (trying to be a bit healthier you know) but the cheese didn’t melt and incorporate the same way a full-fat cheese would. Either way, the soup tasted amazing. So, if you don’t mind a bit of a different texture, I’d suggest using the fat-free cheese for a healthier soup. Heat the butter in a large pot or dutch oven over medium-high heat. Add the onion, carrots and celery; cook until soft (about 20 minutes), stirring occasionally. Add the garlic and flour and cook an additional 3-4 minutes. Add 1 cup pale ale while stirring to incorporate it smoothly. Stir until a thick paste forms (2-3 minutes). Stir in the Worcestershire sauce, milk and chicken broth and bring to a boil, then reduce the heat and let it simmer for 10-15 additional minutes. Remove the pot from heat and puree it with an immersion blender, or blend in a blender. Return the pot to medium-low heat and slowly add the cheese while stirring. Do not allow the soup to boil. Top with crutons and bacon bits before serving. I am a beer drinker but and have to say I am always amazed by the extra flavors and depth beer can add when cooking. You do have to use a decent beer. I am sure this is extremely good. Wow! I made almost this exact same soup last night and will be sharing it on my blog tomorrow. I’ve got the perfect cheese for this and sadly it has all the fat but it will be DEEEvine in this soup! I’ve never made a soup like this before. It looks very tasty. In fact, I think I’m going to make it! With full fat cheese, no less! 🙂 Cheers! Mmmm, looks delicious 🙂 In Cleveland it was in the 60s today, and people started wearing capris and t-shirts! I have never added beer to a soup but this looks totally inviting. I think I would go for the whole fat cheese though. Lovely soup. Wow, this soup looks perfect. I need to start cooking with beer! I gave up on using fat free cheese years ago as it just doesn’t cook well. Instead, I make sure to use fuller flavor cheeses (like sharp cheddar instead of mild), use less of it, and don’t eat it every day. Seems to work! I am jealous of all your rain! You can send some my way and I’ll be so happy. Plus it’ll give me an excuse to make this soup! 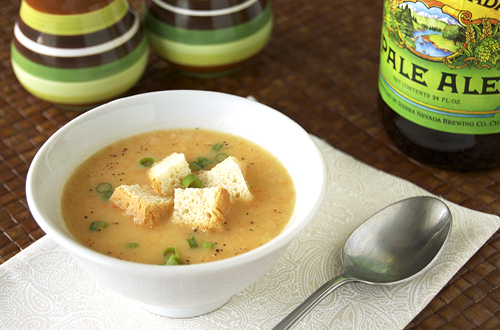 I love beer cheddar soups (it’s one of my favorites) so any reason to slurp up a bowl is welcome. Seriously <3 that you posted this. I have a beer cheddar addiction or beer gorgonzola or whatever combo I can find. I made dubliner ale mac and cheese the other day that was to die for. Imma have to try this! Only problem is I literally just committed to and went out to by all veggies and what-not for the detox you sent me a while back…what to do what to do!!!! Wooo! Sierra Nevada! That’s from my neck of the woods. Heck I even worked there! You know, I have yet to try a beer cheese soup. Which is odd because those are two of my favorite things. Thanks for the heads up on the fat free cheese, as much as I’d like to health things up, I’ll stick with the regular cheese. I’m not a fan of beer either but it seems to go amazingly well with cheddar cheese! This looks delicious with the croutons on top. All the flavors going in make it sound super tasty! Hi, I followed you here from a comment on Infinite Living. I recently start a blog for woman on fitness and health and thought you might enjoy it. It’s Your Life, Live it the fullest is a blog for women’s fitness and health. I just made Cheddar Ale soup last weekend, this looks delicious! I love cooking with beer. This cheddar soup sounds absolutely divine too! Beer cheese soup has long been a favorite in the Northwoods where I grew up. Glad you’re enjoying it in (mostly) sunny Hawaii!